Pizza is originally from Italy, but because a good cake for her work, if the preparation of the dough use the technique of the Italians themselves. To make it easy, all the products available and, most likely, always have at home. Take a deep bowl with wide sides and sift the flour (instead of bowls you can do it on a clean surface desktop). Add the flour, salt and mix. Yeast dissolve in a small amount of warm water, leave them for 3-5 minutes. Add the yeast present in the flour. There also pour in remaining water and add 2 tablespoons of olive oil (the oil will give the dough elasticity and extraordinary taste of the finished cake). Start kneading the dough. Use this process only your hands, as dough prepared in a food processor, it will turn out completely different. Knead the dough on the table until until it becomes elastic. If too liquid, add a little flour. On the contrary, if it is too stiff, pour in the liquid. Grease a bowl with olive oil and put into it the dough. Cover with a tea towel and leave in a warm place for 30-40 minutes. After this time try the dough the elasticity it must not tear when stretching. 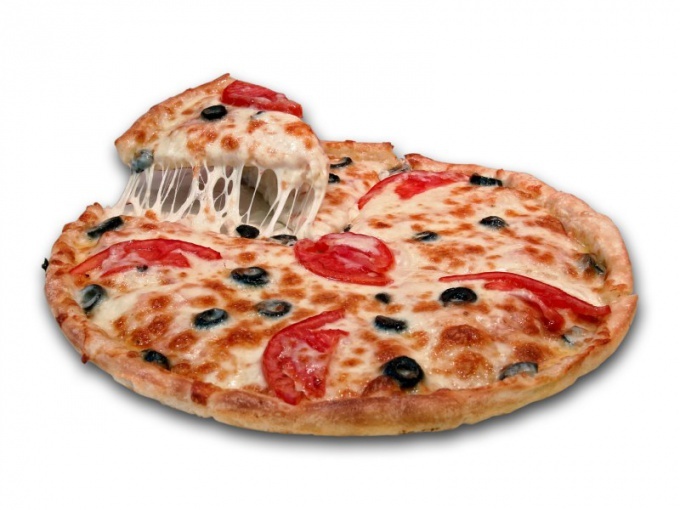 For thin crustand the pizza divide the dough into two equal parts. Fans of lush pizzas from this amount of dough to make just one cake. Again knead the dough for 5 minutes and leave in the bowl for a further 15, covering it with a damp towel. Roll out the dough. For this you can use a rolling pin, but the Italians do everything with your hands. Turn the dough out onto the surface of the table, dusted with flour. Holding the center of the dough with your hand, pull back on his side to obtain of the circle. Optionally, you can leave a rim around the circumference. Before sending the pizza into the oven and grease a baking sheet with olive oil and lightly sprinkle with flour, and before putting on the cake with the filling, brush and a small amount of olive oil. Baked thin pizza about 15 minutes at 220 degrees.